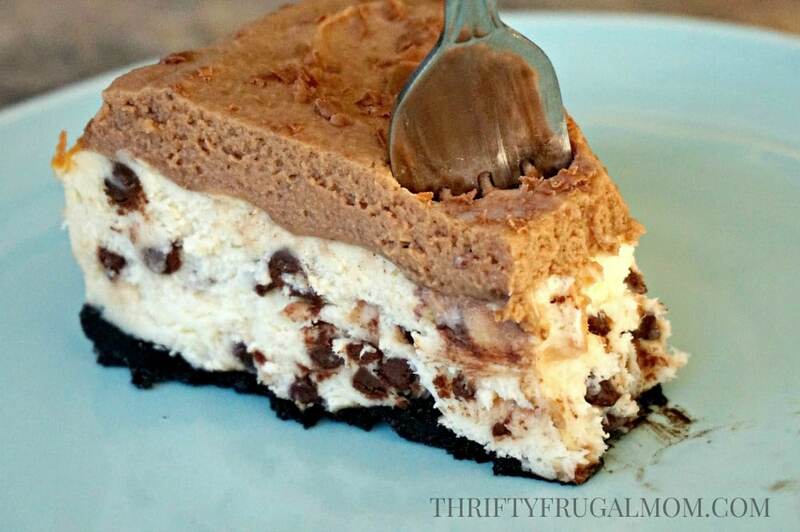 This Decadent Frosted Chocolate Chip Cheesecake is one of the best cheesecakes ever! And you can’t beat that fluffy chocolate frosting! I love desserts of all kinds, but if I had to pick a favorite, I’m pretty sure that it would be cheesecake. There’s just something about that little bit of tart flavor mixed with the sweet that gets me every.single.time. I’m such a fan, that I even got my husband, who used to think he didn’t like cheesecake that much, converted into a cheesecake lover! The downside of that is that I now have to share my cheesecake. 🙂 But it also means that I make it more often than I used to because he gets hungry for it, so that’s definitely a major plus! I don’t know about you, but making cheesecake used to intimidate me. I’d heard all those things about it being sort of touchy, how it cracks easily and how hard it is to get the cheesecake mixture the correct consistency. And so for a long time, I didn’t even try making my own and would instead just enjoy a slice every one in a while when we ate out. 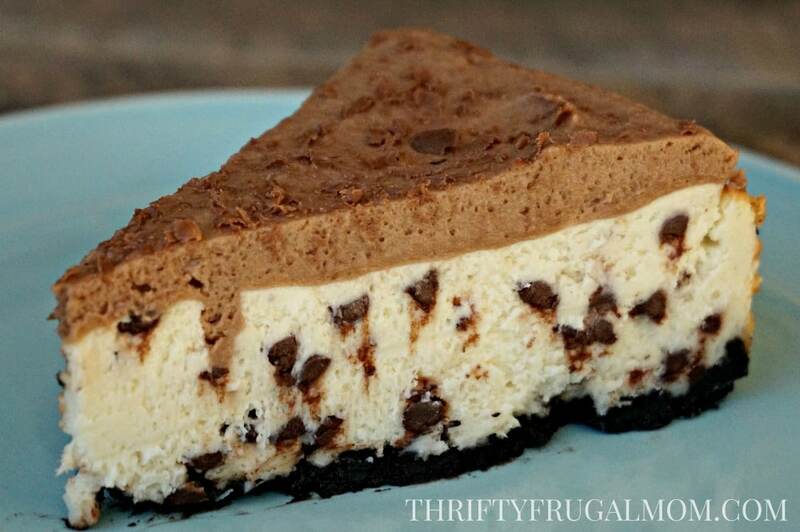 But then I came across this Decadent Frosted Chocolate Chip Cheesecake recipe and knew that I had to give a try because we love chocolate chip anything. Plus it was a frosted cheesecake. So hey, if it cracked, I had nothing to worry about because I could just cover the cracks up with that creamy chocolate frosting! The thing is, I soon discovered that making your own cheesecake really isn’t that difficult. Basically you want to be sure to not over bake it- it’s actually done when the center of the cheesecake still looks a little jiggly. The other thing that you need to remember is to not over mix the batter. You want to blend the ingredients just until they are mixed in, but no longer than absolutely necessary. And I’ve also found that my filling is much more smooth if I have my refrigerated ingredients like eggs and cream cheese at room temperature when I make the cheesecake. 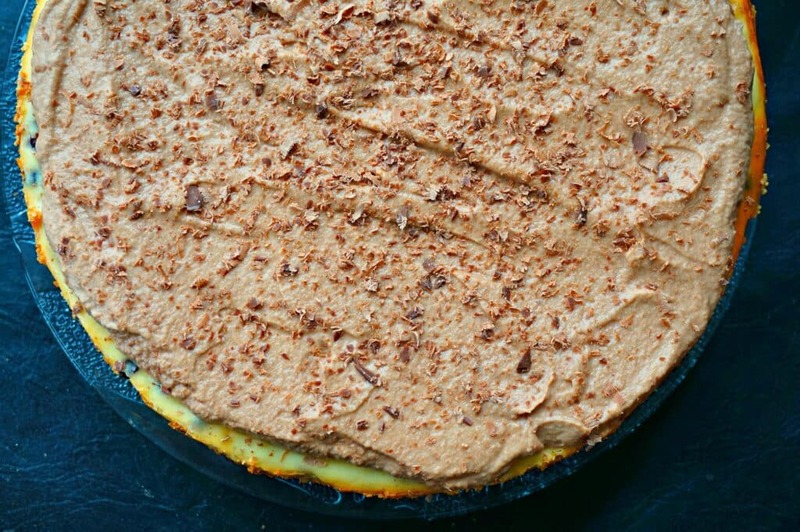 The creamy chocolate frosting is a fun addition to this cheesecake. And while I’m sure it would be good without the frosting, it really does give it that extra wow factor- in both taste and looks! Combine Oreo cookie and butter. Press into the bottom and slightly up side of a greased 10 in. springform pan. Chill for 15 min. 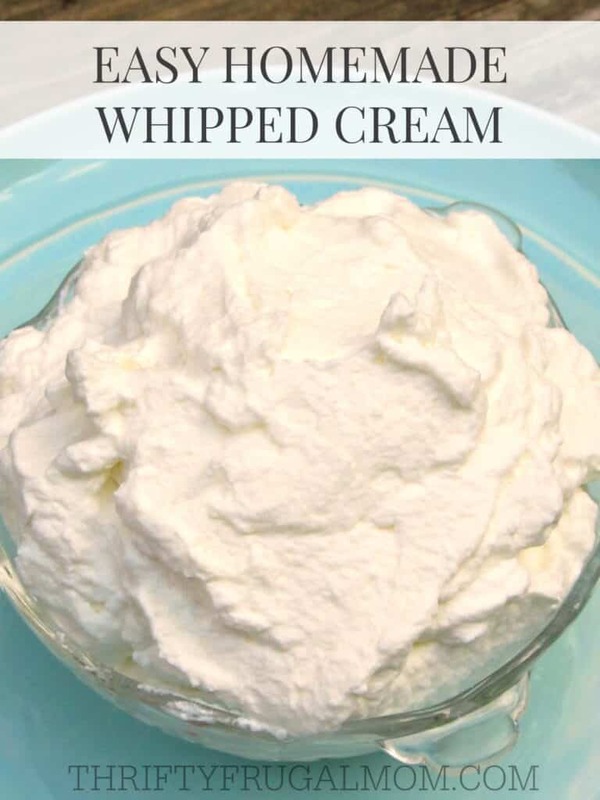 In a large mixing bowl, beat cream cheese, sugar and vanilla until smooth. Stir in 2 c. chocolate chips and once combined, pour into crust. Place pan on baking sheet (it will leak some, so this is important!). Bake at 325 degrees for 50 to 55 minutes or until center is almost set. Cool for 10 min., then run a knife carefully around the edge of the pan to loosen. Cool at room temp for 1 hr. then refrigerate for at least 6 hrs, before serving. In a microwave safe bowl, melt 4 oz. milk chocolate (do this at small intervals of time and stir between each interval so that you don’t scorch the chocolate). Cool to room temperature. Once cool, stir in whipped topping. Frost cheesecake. If desired, garnish with grated chocolate. A 9 in. springform pan can be used instead, baking time may need to be changed though. The cheesecake can be made a day or two in advance, however, it’s best to wait to make the frosting until no more than several hours in advance. In a microwave safe bowl, melt 4 oz. milk chocolate (do this at small intervals of time and stir between each interval so that you don't scorch the chocolate). Cool to room temperature. A 9 in. springform pan can be used instead, baking time may need to be changed though. The cheesecake can be made a day or two in advance, however, it's best to wait to make the frosting until no more than several hours in advance. Recipe adapted from this Taste of Home recipe. Oh, I love chocolate chip cheesecake! My recipe is very similar. 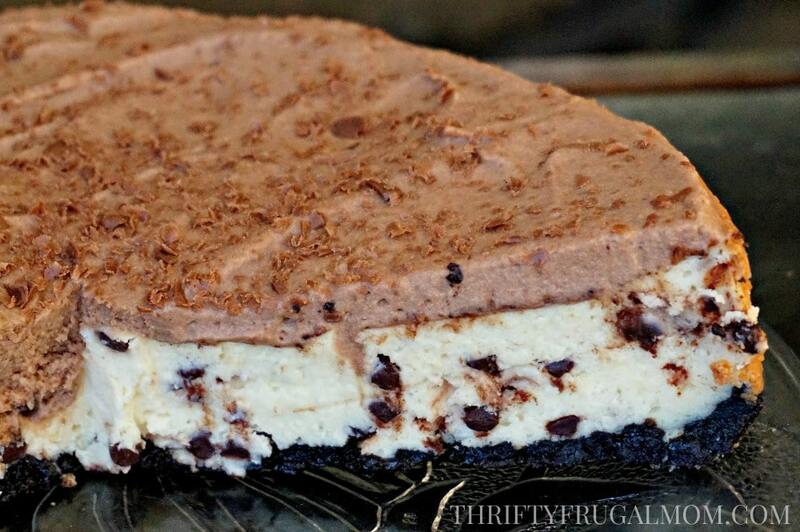 BUT, I've never tried a frosted chocolate chip cheesecake! I will definitely have to try this next time I make cheesecake. This is my kind of dessert! So decadent! It's a "true" dessert for sure! Wow , this is just what I need. My son graduates high school in a couple of weeks. Unlike all of our other children's graduations, we don't have any extra money. ( sadly a bad car wreck has limited my income ) I think he will love this for our celebration dinner. He loves chocolate chips and that chocolate icing will be a big hit. I have all the ingredients on hand except for the cookies. Congratulations to your son on his graduation! Yay! I'm sure the cheesecake will be be well received- I haven't met anyone yet who likes cheesecake that hasn't loved it. And bless you for trying to make the best of a tough situation (the car wreck and resulting limited income). I'm currently on WHOLE30, but this will have to be the first thing I make when I am not! Haha! This seriously looks delicious. My mouth is watering! What a delicious and decadent treat! Delicious and decadent- perfect words to describe this for sure!